While we'd like to use our smartphones overseas the same way we do at home, it's not always possible. Unless you're on T-Mobile's Simple plan that includes free SMS and international data, you'll usually pay a small fortune to use global roaming. Using offline apps for navigation, translation, guidebooks and more helps avoid many of those charges, but there's one thing you can't do without a connection: communicate with friends, family and travel partners. Whether you're trying to figure out where to meet your friends after a long day shopping in Paris, or chat with the folks back home to let them know you're alive and well, you need to be online to do it. That's fine if you can find some Wi-fi – but it's a problem if you can't. While I typically recommend buying a local SIM card in these situations, there are times when you won't want to. If you're only in a country for a few days, the process can be too expensive, time-consuming and difficult to make it worth doing. International SIM cards are usually expensive – not as bad as roaming, but still pricey, especially if all you need to do is send a few messages backwards and forwards. 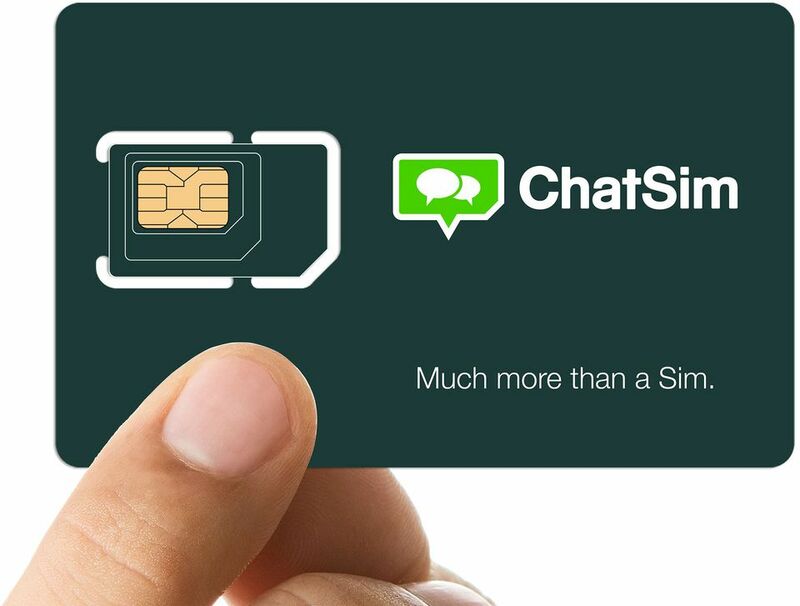 Realising this, a company called ChatSIM came up with an idea. As the name suggests, it sells a SIM card that only lets you chat – nothing else – for a very low annual cost, with no roaming fees. It sounded good in theory, but is it actually any use? The company sent me one of its cards so I could find out. The first thing to note is, like any other SIM card, you need to have a GSM-capable phone that's not locked to your carrier. Almost all phones sold on contract are locked, and several models sold by Verizon and Sprint don't have GSM capabilities. If you're not sure about either of those things, talk to your cell company about your options. If it can't or won't help, a basic unlocked Android phone can be bought for around $60 on Amazon. The SIM itself is much the same as any other, full-size with cut-outs for micro and nano. The card costs $13, and each year of service (including the first) costs a further twelve dollars. That price gives you text and emoji-only use of nine different chat apps, including Facebook Messenger, WhatsApp, Telegram, and several others, in over 150 countries. If you want to make phone calls via any of the apps, or send photos, video or sound, you'll need to pay extra. Pricing varies substantially, and is done somewhat opaquely in the form of “credits”. Ten dollars buys 2000 credits, which gives you “up to 200 photos, 40 videos or 80 minutes worth of calls” in many parts of the world, but as little as one-fifteenth of that in countries like Cuba or Uganda. Check the pricing carefully! The only other price to mention is shipping. Shipping a SIM card costs over $11 – a surprisingly-high amount. Buying two or more cards upgrades the shipping method, along with the price: you'll be up for nearly seventeen dollars. Given how small and light the SIM packages are, that's a cost that really needs to come down. I had the perfect opportunity to use the ChatSIM when some British friends came to visit, but didn't have unlocked phones or affordable global roaming. I loaned them a spare phone with the ChatSIM inside, so we could message each other for the week they were in town. Installation wasn't difficult, but there were a few hoops to jump through. After activating the SIM on the company's website, I followed the instructions on the setup page to turn on data roaming, disable background data and add the network settings. My friends were able to send text and emojis from their preferred chat apps (Telegram and Facebook Messenger) throughout their stay, without a problem. As expected, none of the other apps that needed Internet access worked unless the phone was connected to Wi-fi. A few weeks later, I took a trip to Portugal, and tested the ChatSIM out myself. No other setting changes were required, and the phone picked up a local network within a minute or two. WhatsApp, Messenger and Telegram all worked immediately, and again, other apps did not. One thing I would have liked to see was the ability to buy credits from within an app. Right now, you can only buy them by logging onto the company website over Wi-fi. If you're stuck in the middle of nowhere and need to call a taxi, you'll need to have a positive balance on your account already. Being able to add credits on the spot, using ChatSIM's data network, would be much more useful. The ChatSIM is a one-trick pony, but it's a good trick. You don't get to use all of your smartphone features, but with the right mix of offline apps and occasional Wi-fi networks, it could be all you need. It's not perfect -- as mentioned, the shipping costs could definitely do with a price cut. The cost of making calls and sending photos in some countries is also high, but it's optional. If all you want to do is send text-based messages while you're traveling, being able to chat to friends, family and anyone else for twelve bucks a year is a bargain.